Home > Comet Clutches and Parts > Comet Industries 207915A. OEM Replacement Secondary Pulley. Comet Industries 207915-A. OEM Replacement Secondary Pulley. Comet Industries 207915A. OEM Replacement Secondary Pulley. Comet Industries 207915A. 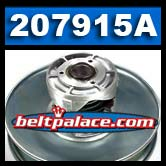 Replaces obsolete Salsbury driven clutch 207915-A/C. These new build models now use Green Cam Spring, INBOARD Mount only. Secondary Pulley: 9-1/4" Diameter, 1-3/16" Top Width Belt required, 7/8" Bore with 3/16" Keyway. Genuine Comet Industries part made in USA!